Just like the animal kingdom, the world of exchange-traded funds (ETFs) has its own living and breathing components that comprise the ETF ecosystem. Little do investors know that they’re all part of an even bigger map of the ETF ecosystem within an even bigger capital markets universe. Encountering the various roles and knowing what those roles perform, such as data vendors, trustees, sub-advisors, and execution venues can be daunting–it can be akin to an animal lover getting parachuted into the middle of a zoo without a map–where does he or she start? 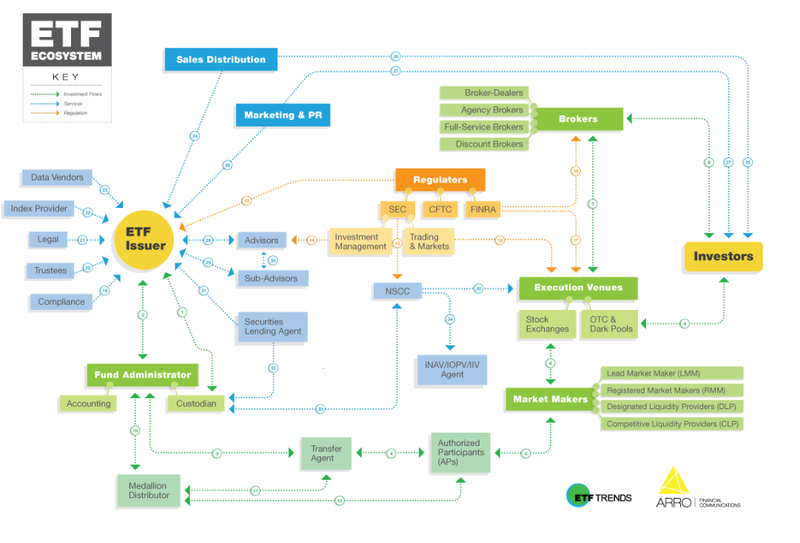 Fortunately, ETF Trends in conjunction with ARRO Financial Communications created an ETF Ecosystem map that outlines the participants in the ETF ecosystem, as well as how they interact with one another. 1. The ETF issuer communicates the fund’s market trades as well as details of the creation/redemption basket to the Custodian, who in turn provides safekeeping of the assets, as well as providing the ETF Issuer with an aggregate snapshot of the portfolio. 2. The ETF Issuer and Accounting/Custody work together to process and settle creation/redemption activity when there are orders. 3. When a creation or redemption order is processed, Accounting/Custody processes the underlying basket and the transfer agent processes the ETF shares. 4. In some operating models, the Authorized Participant places orders on the Primary Market with the Transfer Agent instead of directly with the Distributor. 5. Authorized Participants may buy or sell excess shares to the market through market participants. Market Makers may engage Authorized Participants to facilitate creations or redemptions. 6. Market Makers provide ETF liquidity by posting double-sided quotes on the national Stock Exchanges. 7. Brokers who wish to buy or sell retail quantities of ETF shares will facilitate these transactions on the Secondary Market through one of the national Exchanges. 8. Investors who wish to invest in ETFs will engage with a Broker, who buys or sells shares on their behalf. 9. Large Institutional investors may buy or sell ETF shares on the Secondary Market through alternative trading venues such as OTC (Over-the-Counter) and Dark Pools. 10. When a creation or redemption order is processed, the Medallion Distributor approves the order and provides final order details to Accounting/Custody. 11. The Medallion Distributor provides the Transfer Agent with creation/redemption activity for record keeping, and the Transfer Agent maintains this data for the use of the Medallion Distributor in shareholder communications. 12. Authorized Participants initiate creation and redemption activity on the Primary Market through Medallion Distributor systems, and the Medallion Distributor provides confirmations to Authorized Participants. 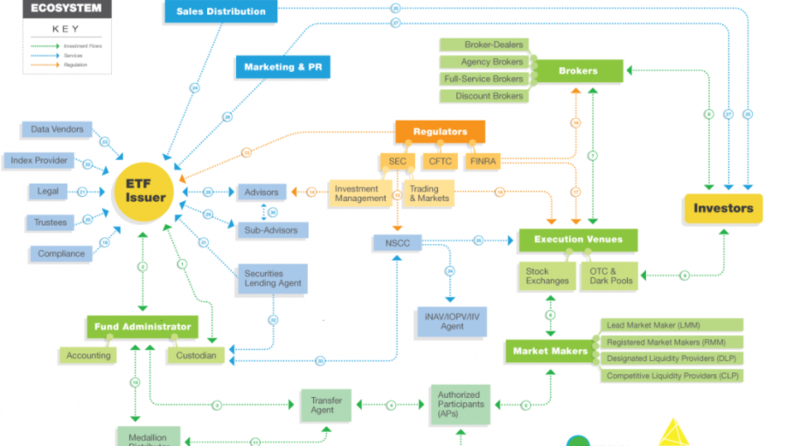 In order to ensure that the ETF ecosystem is running smoothly, regulatory bodies, such as the Securities and Exchange Commission (SEC), U.S. Commodity Futures Trading Commission (CFTC) and Financial Industry Regulatory Authority (FINRA), as well as parties like legal and compliance, provide the necessary oversight. 13. ETF Issuers operate under various rules and regulations including the SEC for asset management activities, FINRA for sales activities, and the CFTC when certain derivatives are involved. 14. The Investment Management division of the SEC monitors the Investment Advisor to ensure compliance with multiple federal regulations. 15. The NSCC (National Securities Clearing Corporation) is regulated by the SEC. 16. The Trading and Markets Division of the SEC monitors and works alongside Execution Venues to ensure efficient, transparent markets, as well as overall capital market integrity. 17. FINRA regulates member brokerage firms and exchanges.